Jaguar Land Rover has developed a system that projects the direction of travel onto the road ahead of self-driving vehicles, to tell other road users what it is going to do next. The intelligent technology beams a series of projections onto the road to show the future intentions of the vehicle - for example stopping and turning left or right - as part of research into how people can develop their trust in autonomous technology. In the future the projections could even be used to share obstacle detection and journey updates with pedestrians. 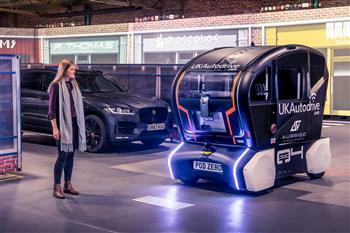 Jaguar Land Rover has developed a system that projects the direction of travel onto the road ahead of self-driving vehicles, to tell other road users what it is going to do next.